Today, I am going to talk what you should feed your Havanese with. I am a little different from many Havanese owners that I think it is fun to cook for your Havanese. So, in this blog post, instead of just listing out a list of brands that make some pretty good dog food that is suitable for your Havanese, I am going to talk about what you can cook reasonably easily for your Havanese. At the end of the day, it comes down to personal preference and also your Havanese’s born-in preference and habit-caused preference. The exact type of food doesn’t really matter while the nutrient that you should provide to your Havanese does matter a lot. Boiled chicken is probably one of the easiest things that you can cook for your Havanese and he would very likely love it. You may prepare baked chicken instead of boiled one if your Havanese happens to not interested in the boiled version, though I would recommend you to keep things simple and stick to the boiled chicken. It may be a little hard for him to go back to boiled chicken if he has tried the baked version which is generally a little less healthy. If you are wondering which portion of the chicken you should cook, I think boneless skin-on thigh has the best balance between being tasty and being healthy. If your Havanese tends to have overweight problem, you may want to prepare boneless and skinless chicken breast for him. Let’s be honest here, there are times when I just run out of meat at home and I still want to provide some protein to my Havanese. In these cases, making a hard boiled egg is a really good idea. I like to only give him half an egg since some people believe that eggs’ protein are not as easy to digest as protein that come in some other forms such as from meat. If you are a family lady or man, you may already know the joy that comes from baking already. While it is fun to make yourself muffins, breads, cakes and even pizzas, it is also very rewarding to make biscuits for your Havanese and see their happy reactions. There are all sorts of great dog biscuit recipes you can find on the internet. The key thing to note is that you can always reduce the amount of sugar and butter to avoid your Havanese from having weight problem. I found it actually enjoyable to eat some of those food biscuits myself and I would not enjoying eating a commercial food biscuit. It helps you gain a lot of confidence in the food when you know what are all the ingredients that the food is made off. And biscuit simply tastes better when they are hot and crispy. Although meat and snacks taste great, you still have to provide your Havanese with enough fibre. Generally, most boiled vegetable are great for your Havanese but I tend to play safe and I don’t feed them with vegetable that are suggested to be slightly harmful to dogs. Things that are super safe include carrots, pumpkin and green beans and red tomatoes. Things that are believed to cause potential problems under some very specific situations are broccoli, cabbage and cauliflower and I simply avoid them. The list of vegetable that you absolutely should not feed your dog includes onion, garlic and green tomato. So, if you like to play safe just like me, remember to feed them boiled carrots, pumpkin, red tomatoes and green beans and no other types of vegetables. If you want to feed different types that aren’t mentioned or lies within the grey area, I suggest that you have to look for more detailed information from books and trustable websites. While the saying “one apple a day keeps the doctor away” is applicable to human, it also applies to your Havanese too. I would usually give my Havanese half an apple a day, especially when I don’t have enough vegetable in my fridge. Remember that you have to remove the core including the seeds of the apple can they can be really difficult to digest and it may also hurts the throat of your Havanese. It is a great source of fibra, potassium and vitamin C which are all essential to their health. If the portion of your main meal isn’t quite enough or your Havanese simply has exercise too much that he seems to be more hungry than he usually is, giving your Havanese half a banana to eat is a good idea. Banana is one of the rare type of fruit that can make you full in a short amount of time. 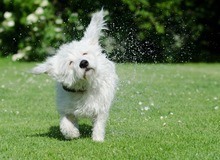 Its sweet taste can also make it very enjoyable for your Havanese. One thing to note is that you can’t regularly replace apple with banana as apple is a lot more healthy in terms of its amount of fibre. If you don’t believe that, go try experiment on yourself. Say you eat one apple a day everyday and you would likely be able to go to washroom pretty smoothly. Try another week by eating banana instead of apple and see if you have the same smooth experience. There are people who like to feed their Havanese with raw meat as they think that would be more healthy for them. That’s only half correct. While raw food usually have better nutrients, they come with a lot of bacteria too. So, it is your choice to whether make them as close to their nature as possible or to give them cooked food to minimize the risk from bacteria while still keeping a reasonably high percentage of its raw nutrient by boiling the meat or food. For those of you who can spare some extra time to cook for your Havanese, I would highly recommend you to try these ideas. It is almost always nicer to have as little as commercial food as possible, for both you and your Havanese.